Lindsay spent 6 weeks researching the prevalence of the veterinary drug diclofenac among pharmacies, veterinary centres and farming communities in southern Tamil Nadu as part of her dissertation research into the decline in the vulture popluation. Diclofenac, an anti-inflamatory drug administered to cattle, causes kidney failure and death to vultures when they eat the carcasses of dead cattle. One polluted carcass kills an entire flock of vultures, the lack of which has lead to an explosion in the number of feral dogs and rats which in turn spread diseases such as rabies. 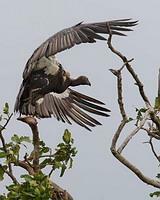 99.5% of all vultures are now extinct accross India. Projects Abroad is working closely with the UK's Royal Society for the Protection of Birds (RSPB) and India's Birdlife India charities to educate vets and farmers in the use of alternative anti-inflamatory drugs as well as monitoring the continued use of diclofenac (it's now illegal to manufacture diclofenac but not yet illegal to use existing stocks of the drug) and now observing the recently discovered last remaining flocks of vultures in northern Tamil Nadu.